Group Discussion is a very important part of the whole selection process for entering into a B- School. 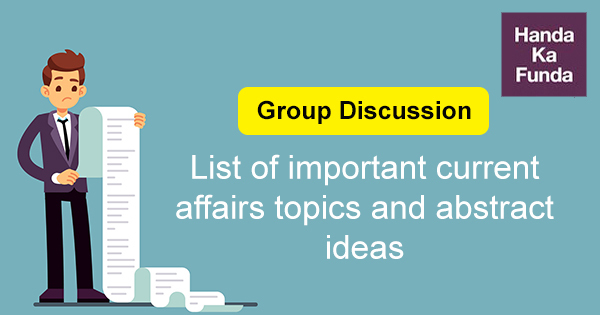 The first question that arises as we start to think about Group Discussion stage is – What could be the probable topics for GD? It is a common notion that only current affairs based topics are given for GD. This is not the case. There are various kinds of GDs like abstract topic based, opinion seeking, case based, facts/knowledge based etc. We at HandaKaFunda have curated a list of the absolutely crucial topics for your GD preparation. Can triple talaq bill empower the muslim women? Can India become Electric Vehicles only nation? Is farm loan waiver a viable solution? India should move to a Presidential form of Government. Long term capital gains tax – Who are the winners and who are the losers? Planning commission or NITI Aayog- has anything changed at ground level? Is Indian demographic dividend being underutilized? Government should not bail out nationalized banks which are bankrupt. Should India finance its infrastructure through internal finances or external borrowings? Is UDAAN scheme just beneficial on paper or will it have effects on the ground level? Should India focus on Smart Cities when 30 crores of its citizens are still without electricity? Farmers’ income can be doubled by the year 2022. What are the challenges faced by the farmers and how can these be tackled? E-commerce will ruin the retail stores. Can India be a developed country and a Super power? Effect of demonetization on common citizen vis-a-vis black money holders. In a resource starved country like India, spending on space missions is a wastage of resources. Do programs like Namami Gange help cleaning rivers in reality? Indians are not conscious about quality. Is India’s Foreign policy pro-US? Primetime media discussions are propagating intolerance. How would you spend an unexpected holiday? What would you do if you woke up one morning to find that you didn’t remember who you were? If you could go back in time and change something in your life, what would that be? Is marriage a dying institution? Are move-in relationships a boon for guys and a bane for girls? How India is about to manage water crisis? Is there good reason for the American war on terror? Is television an effective tool in building the minds of children? Should jobs be subcontracted into developing countries? Is the grading system used in high school effective? Do celebrities get away with more crime than non-celebrities? Is there a need to curb the mushrooming of private coaching institutes? Should Pakistani artists be banned from working in India? Is success a journey or Destination ? You versus who you want to be. Doing the right thing the wrong way ? The thin line between right and wrong. Do women in the 21st century still face a lot of barriers to rise to senior management positions? Borderless world – a myth/reality? Management- An art or science? Is India over employed or overqualified? MBA in India is highly over-rated. ‘With increasing unemployment, India should ban all its efforts on self-driving cars. Should advertising targeting children be banned? Confidence is of utmost importance in a GD. Knowing these topics well beforehand will act as a confidence booster. The second step here would be to practice. Try to make groups of 6-12 people and discuss these topics. Entering the GD 3-4 times with quality content is enough. Do not speak very long sentences. As it is rightly said – Brevity is the soul of wit. Unsure about how to prepare case based GDs? We have got you covered.